Properly installed asphalt pavement can last up to 25 or 30 years if it is professionally maintained — which includes having potholes and cracks patched as soon as possible. Asphalt pavement that does not receive repairs when they are needed will have a much shorter lifespan. Most patches are installed during the spring and summer. Winter weather can be rough on damaged pavement, especially repeated freeze/thaw cycles. By having repairs performed early, the asphalt has time to cure properly before severe weather arrives. The patch also needs time to cure before a sealant is applied. Asphalt pavement must be both strong and resilient. It relies on its foundation for proper support. When water penetrates beneath the surface through a damaged area, the water will spread and eat away at the foundation. 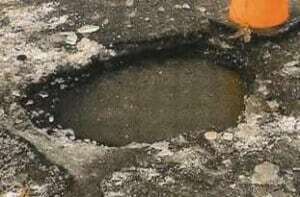 This causes further damage to the surface, including potholes and an extensive cracking pattern commonly called “alligatoring.” Alligatored asphalt cannot be patched, so repairs are more extensive. Asphalt contractors typically choose between two patch methods: full-depth and surface. A full-depth patch involves the removal of the damaged area as well as (normally) a section of the sub-base. New materials are then inserted. Surface patches are not as durable, but they are less costly. However, surface patches cannot be applied if the surrounding asphalt is in poor condition. With a surface patch, existing material is not removed. Instead, new asphalt is spread over the damaged area and adjacent surface. To request a free quote or discuss any of your asphalt pavement needs, call Asphalt Pavement Solutions at 856-544-3990. 856-461-1710 or toll-free at 1-800-559-SEAL. You can also submit the online form found on our website. We have been providing asphalt solutions for more than three decades to customers in the states of New Jersey, Delaware and Pennsylvania. Whether you need asphalt repairs, parking lot striping, sealcoating or traffic signs installed, our highly trained team members can assist you.